A first cover appearance for 2013 has been released – and it’s a stunning one! 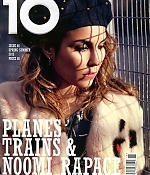 Noomi Rapace is the cover girl of 10 Magazine’s Spring/Summer issue and a few excerpts from inside have been added to the gallery, with many thanks to Filip for letting me know. You can get the latest issue or magazine app on their official website.